WYNDHAM residents are set to spend less time waiting to see a doctor after the long-awaited Wyndham Vale GP Super Clinic was officially opened last week. 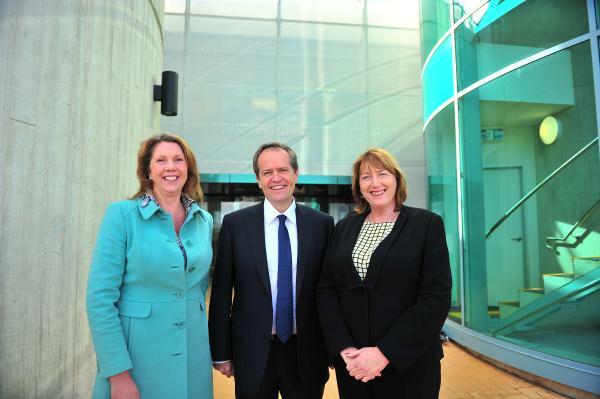 Federal Leader of the Opposition, Bill Shorten, unveiled the new $15 million clinic on Wednesday, claiming it would plug a gap between local GPs and hospitals. “Rather than services following after the community has grown, we have a service here that will grow with the community,” Mr Shorten said. Member for Lalor, Joanne Ryan, said the Super Clinic, which was announced by Julia Gillard when she was Prime Minister, would make it easier for residents to speedily see a doctor. “This is great news for the community of Wyndham Vale. It’s great news for the region and a much-needed facility in this area of high growth. There are approximately 70 babies born each week, 15,000 new residents in the last two years and a population of 200,000 expected by the end of this financial year,” Mr Ryan said. But the Federal Minister for Health, Peter Dutton, threw a dampener on the event by claiming that the new clinic was delivered late and with only one doctor on duty. “It’s clearly a momentous event for Labor when one of their so-called GP ‘super’ clinics finally opens – almost four years after it was promised – with just one doctor,” Mr Dutton said. “That’s truly success on a grand scale for Labor. “Although taxpayers who forked out $15 million for Labor’s Wyndham Vale ‘super’ clinic might tend to see that track record as a grand failure. In fact, they might wonder just how ‘super’ a clinic with one doctor actually is,” he said. The CEO of ISIS, the company that will be running the clinic, Terry O’Brien, told Star that it was, in fact, delivered three years after they received the contract from the Commonwealth to construct it. “Until we get a contract to construct, we don’t start building,” Mr O’Brien said. “Sure, we only have one doctor, but that’s because we’ve only been open for a week or two and we don’t have the demand for more doctors yet, but we do have a plan to go to 12 doctors. “Until we get to 140 appointments a week, we don’t need a bunch of doctors standing around. The Wyndham Vale GP Super Clinic is located at 150 Ballan Rd, Wyndham Vale.